Japanese poet Otama exclaims, a�?In this life, let me enjoy myself,a�? as he sips his cup of rice wine, or sake, a�?And in lives to come, Ia��ll be happy to be a bug or a bird.a�? 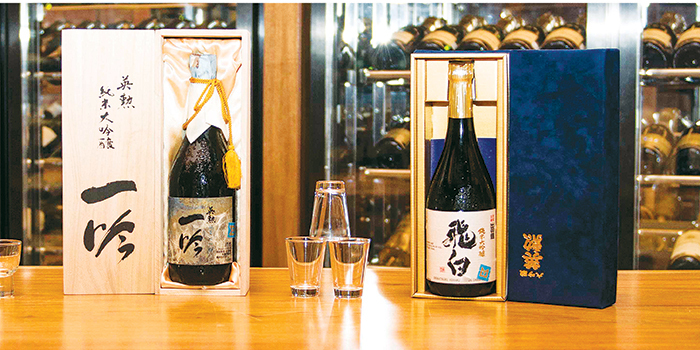 Learning to sip sake wine at the Grand Cholaa��s Pan Asian under the watchful eyes of sommeliers Afroz and Hannah, both guardians of the Japanese rice wine etiquette, we entered the seductive world of sake, the alcoholic beverage that has inspired poets and princes. By the end of the evening, we managed to have both an experience of drinking sake and eating a bug, though one that had thoughtfully been made into a chocolate dessert by chef Vikramjit Roy. It looked exactly like shiny brown worms in a pot of chocolate mousse that even had a sprig of fresh mint growing out of it. We thought that like so many of the Japanese poets writing about the perils of drinking rice wine, we had been truly sloshed. a�?You never pour the sake for yourself,a�? explained Hannah, who has spent many years in Japan. a�?If you are the host, you pour the sake for your chief guest and then each person in turn pours the sake for his or her neighbour.a�? While receiving the sake, the guest holds the cup, usually a small porcelain cup with the left hand under the base and the fingers of the right hand around the rim. The host makes sure that the cup is never allowed to run dry. The wise men tell you, a�?Take tiny, tiny sips,a�? or you will soon find yourself under the table.A�The trick, of course, is to eat something zesty as you sip the sake. Chef Vikramjit served pale slices of white fish, or green apples, infused with delicate flavours to go with each sip. For the second round, we had shiitake mushrooms, seared foie gras on scallops, followed by soft-shelled crabs, all the way to the chocolate worms. By the end of it, we allow ourselves to be seduced by both the food and the sake.